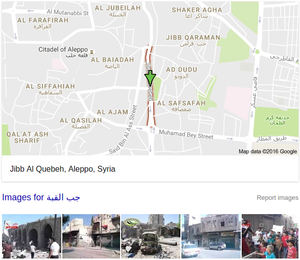 Location of Jibb Al Quebeh according to Google Maps. The location of the incident is 80 meters east of the green arrow, on the eastern side of the park marked in green. A view toward Jub al-Quba as seen from the direction of the Aleppo Citadel. An artillery spotter in the Citadel would be able to see traffic in the north-south roads as they passed the intersection. #Syria: Rescue teams search site of blast following Syrian regime airstrikes on residential areas of Jub Al Quba neighborhood, Aleppo. SNHR: at least 17 victims died due to suspected Russian warplanes missiles fired the road leading to Jub Al Quba neighborhood from Bab Al Nayrab neighborhood in Aleppo city, November 29, 2016. At least 25 civilians died in government artillery shells fired on displaced families in Jub Al Quba the besieged neighborhood in Aleppo city, November 30, SNHR yet unable to verify the details of the news, 2016. Syrian activists say at least 21 people have been killed in an artillery barrage on a housing area for those displaced in rebel-held eastern Aleppo. 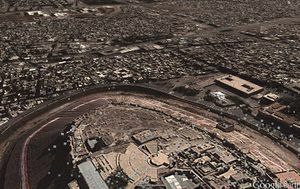 The Britain-based Syrian Observatory for Human Rights monitoring group says the Wednesday morning attack struck the Jub al-Quba district, where residents displaced from government advances on other areas of the city have sought protection. It said it occurred near the site of a government air strike that killed at least 20 the day before. The Syrian Civil Defense search-and-rescue group put the toll at 45 dead. It accused government forces of being behind the attack. NATO backed "moderate" rebels in E Aleppo commit a massacre against fleeing civilians at one safety corridor set up by the Syrian army! Civilians from E Aleppo confirmed that Omar Salkho of Zinki gang is the one who carried the attack on the safety corridor 2d ago. Around 2,000 civilians had gathered in the area from all over to try and cross to the SAA side at a nearby crossing, and started moving around 7 am. But al-Nusra fighters caught on, cut them off one way with orders to turn back, and then the other way and boxed them in on two sides (this operation was led, they say, by a fighter nicknamed Khattab Al Shishani, a local man, not a Chechen (as the name suggests). This is the area the alleged regime artillery (or barrel bomb) trike then hit - however many of that original 2,000 people herded beneath the attack. Of the 45 reported killed, locals only testify to 15. Many would be injured, but theit fate is unclear. It sounds almost like 15 died and the rest walked away, "were then pushed out of the street into the surrounding areas.". and the bodies were left out until 4 pm when the White Helmets came back with body bags and filmed their rescue-recovery scenes. جب القبة -جب قره مان (translit jabb alqubbat -jb qurh man) On Wikimpaia - a narrow east-west strip just east of the government-held citadel. "Photo Effects dumping helicopters to barrel bomb on the areas of Bab Neirab neighborhood of Aleppo, which wounded four civilians were wounded, including three children"
Vice President of the Syrian National Coalition Abdul Ahad Steifo called upon U.S. President Barack Obama to intervene to stop the massacres being committed by the Assad regime and Russian forces. “Although he is in the last days of his term in office, we are fully confident in the ability of President Obama, as the head of the world’s sole superpower, to stop these massacres once there is a will to do so,” he said. 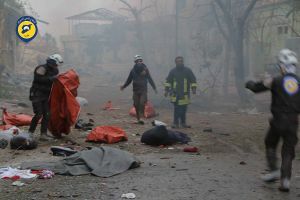 Syrian Civil Defense services said that 45 civilians were killed in an artillery barrage by regime forces on a housing area for displaced people in rebel-held eastern Aleppo on Wednesday morning. Aleppo had in recent days seen a rapid diminishing of rebel-held territory, with government forces reclaiming about a third of all areas within a few days in late November, including a water pumping station rebels had used to shut off reliable water to the residents of West Aleppo (citation needed). RT reports 80,000 civilians had been "saved" in these changes. But according to pro-opposition sources and western media... The Syrian National Coalition said in in statement "the people left inside eastern Aleppo are facing certain death as a result of the onslaught. 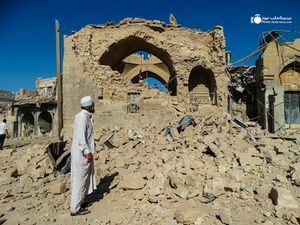 If residents choose to remain inside their neighborhoods they face Russian airstrikes, or regime heavy artillery if they choose to flee for safer areas." The re-conquest has been a "slow-motion descent into hell" for residents of East Aleppo (CNN reports, quoting Bettina Luescher, a spokeswoman for the UN World Food Programme). Rebel fighters and some civilians had retreated into their shrinking core. The reports allege it was some 25-45 of these civilians who were killed in an early-morning airstrike on their new shelter. Around 600 people have been killed in eastern Aleppo since Saturday (Nov. 26), activist sources have told CNN, including 45 on Wednesday, according to the Aleppo Media Center activist group. In western Aleppo, eight others were killed Wednesday, the state-run Syrian Arab News Agency reported. That claim is that 600 "people" were killed in a five-day span. It's not clarified how many were fighters or civilians or if the number is exaggerated. 107 rebels killed in Aleppo (was 103 on Nov. 30). About half were listed as killed by ISIS and half by government or Russian forces, some not sure (can't be searched, not up to counting). So they list some 50 or 60 or so rebel fighters killed during this push that forced rebels to finally give up and retreat. 603 civilians from Aleppo, 11-01 to 11-30 (was 539). 369 killed by "warplane shelling." 155 by other shelling. 355 are adult males (includes unidentified, gender left blank) (was 320). 105 boys, 81 women, 62 girls. So about 100 acknowledged fighters to at least 684 civilians killed, according to VDC records. This is very similar to October's record, with a near-total division of deaths so the Civilian majority is mostly blamed on bombing, while almost every fighter is listed as killed by "shooting." In the span of both months, it's made to appear, Syrian and Russian bombing combined have killed one rebel fighter in Aleppo. That compares to a still-meager 225 rebels killed by old-fashioned "shooting" in the same 2 months, and to 655 Aleppo civilians killed by Russian-Syrian bombs. As an argument for a "no fly zone," that's compelling, if illogical. This page was last edited on 1 September 2017, at 11:52.